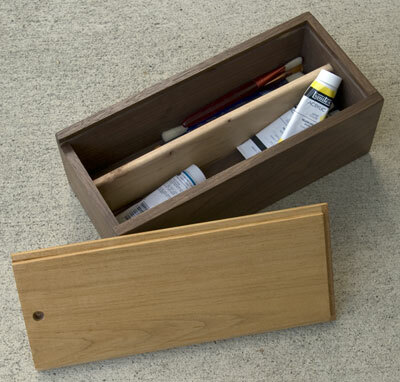 The RunnerDuck Paint Supply Box, step by step instructions. 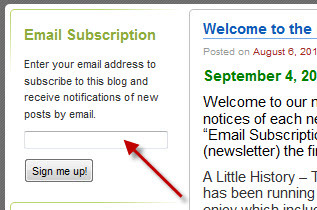 This project appeared in our August 5, 2006 Newsletter. Our grandson, Hudson, celebrated his third birthday this month and the theme was "Party Like Curious George with Paint". While he's a little young for this gift we figure it's something he'll have for many years. Who knows, one day he may even become a famous painter! It's a box to store all his paint brushes and some paint. I actually had this idea and decided to build it out of scrap wood so there are three different kinds of wood, walnut, oak and maple. I think it gave it an interesting look. Cut the sides 5" X 14". Cut the bottom 5 3/4" X 13 3/4". Cut one end 6" X 5". Cut one end 6" X 4 1/4". Cut the center 13 1/2" X 2 3/4". I made dove tails for the corners using my handy dandy Rockler dove tail jig. Be sure to set up your jig using scrap pieces and fine tune it until you have a prefect fit. Remember on the short end you will come up with one less dove tail at the top. 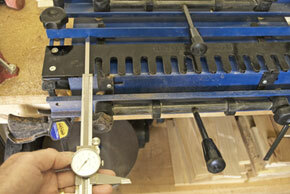 I find that using a pair or dial calipers works great for setting up the dove tail jig. Once you cut the dove tails route the grooves for the bottom, ends and the lid. I used a 1/4" router bit set 1/4" deep. For the bottom I set the fence so that the top edge of the groove would be just slightly above 1/2". 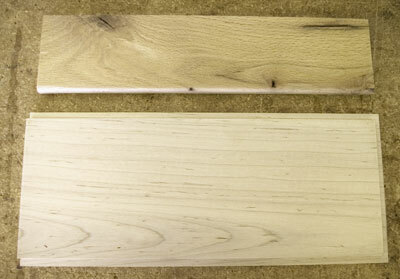 Be sure to start and stop before the ends of each piece otherwise the groove will show on the ends. On two sides and the tall end route the groove the same as the bottom except run it all the way out the front end of the sides. In the bottom route a groove 1/2" wide by 1/4" deep. 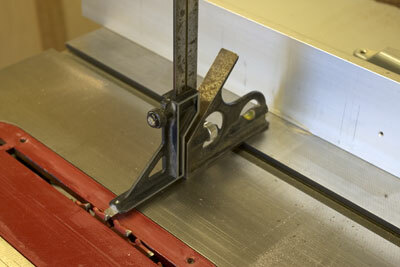 Make two passes with the routed to do this. 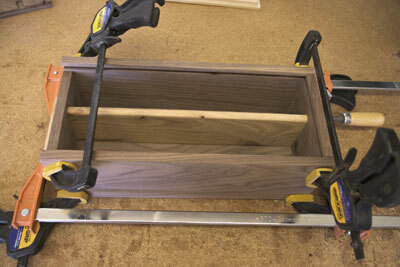 Cut the bottom and top edges to fit in the side and end grooves. 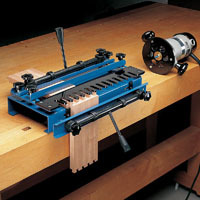 I used my table saw and made one pass with the pieces flat and one pass on the edges. I set the blade to 1/4" high and the fence 1/4" away from the blade. I like to use my height gage on my square to set the blade. Only dado the two sides and one end of the top. Without glue, put the box together and check the fit. Mark the location of the center groove from the bottom onto the ends. Route a 1/2" X 1/4" groove in each end to match the center piece. 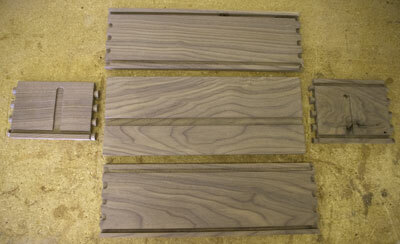 Here are the box pieces laid out. I used a 1/4" round over bit in my router to make the radius the top of the center piece. Sand the insides of all the pieces really good. 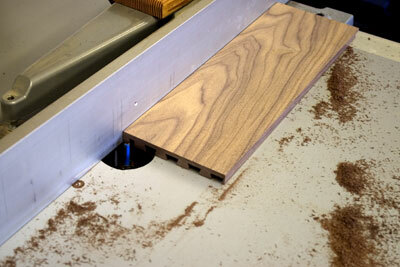 I used a 1/2" router bit to create the finger hole in the lid. I didn't want to go all the way through because it could create a pinch point. You could also use a drill bit but I didn't like the way the bottom of the hole looked. 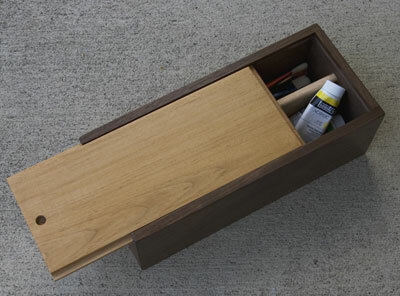 Put the box together with glue and clamps. Sand the outside and apply your finish of choice. I prefer to use the water based stains and urethane's that are available today. What I like best about them is the clean up!